Coming up against a well-entrenched or well-defended enemy position, and not always having air support available, the motorised infantry platoon can find itself in a difficult and vulnerable position. This position is made even more difficult if the enemy is operating out of a fortified village or old buildings and the infantry platoon has to attack without much cover. Although the platoon does have its inherent machine guns down to section level, these weapons are often not able to engage the enemy at range or provide sustained fire support during an assault. Given the weight of both gun and ammunition, the machine gunner is also restricted in when and how he can use his machinegun. In open terrain, the motorised infantryman is given some protection against enemy fire in the MRAP but the situation is compounded when he has to debus to assault an objective. However, with sparse cover, it is difficult at best to manoeuvre in the open whilst under fire. 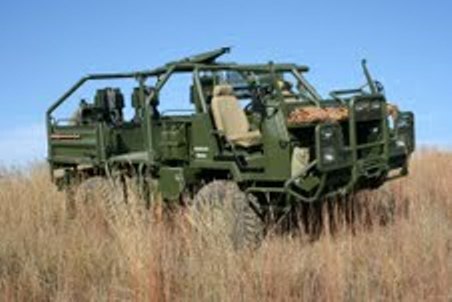 The Hunter is a true MGP/MFT, designed and built to operate over very rough and rugged terrain in dry, sparse areas. Capable of delivering massive sustained firepower against enemy positions, the Hunter is perfectly suited to the conduct of numerous counter insurgency missions such as fire support, follow-up operations, suppressing fire during assaults, casualty extraction, reconnaissance, raids, ambushes, base protection, border patrols and so forth. Its role during conventional operations as a raiding vehicle is equally formidable. Any weapon system can be removed and replaced with alternate weapon systems such as the AGS-17 MGL. The vehicle can also be fitted with grenade launchers, giving it the ability to produce a smoke screen. Although some doctrinal issues are still being worked on, there will be between 6 and 8 MGPs/MFTs attached to each motorised infantry company. This will, depending on the mission, allow the company commander to detach 2 MGPs/MFTs to each platoon and still maintain a reserve for deployment elsewhere. With a maximum gradient of 60 degrees and a sustained road speed of between 70 and 80 km/h, the Hunter will be able to maintain its position in an MRAP deployment. It also has an off-road operating range of approx 500kms (with an additional 120 km with Jerry cans). A command post vehicle is currently under development. This MGP/MFT will be a very welcome addition to any offensive/defensive motorised infantry task. When Sun Tzu wrote about the need to know both the enemy and yourself, his words held an importance many nowadays seem to simply ignore. I am extremely fortunate in that I still get to meet many senior military officers from across the world and one thing that strikes me as odd is that very few truly know “themselves”. Of course, they know what training they and their men have had and mostly know how to use it but they are not always fully aware of their capabilities if their real or perceived combat scenario were to change suddenly. As an ex-soldier, I am fully cognisant of how rapidly we can develop tunnel vision and neglect our abilities to think laterally. Sometimes, we need to think outside the box. At other times, we need to ask...and listen. Asking appears to be something many of us shy away from lest we be seen as unable to do our tasks. But, when lives are at stake and the choice is either success or failure or victory or defeat, there can be no shame in asking. By “knowing ourselves”, we should be aware of our weak and strong points. Whereas we seldom want to admit we have weak points, it is too late to come to this realisation when the pressure is on, the lead is flying and we have run out of options. At such a time, pride will be of no value to us. If we truly know ourselves, we will know our true capabilities. Having had the privilege to serve under one of the best small team commanders in the old SADF, I recall once being loaded with 15 magazines for my AK, a 100-round belt for the PKM, 20 40mm rounds plus the launcher, 2 bunker bombs, the VHF radio as well as the HF radio – along with my food, water and shockpack. With my knees buckling, I made it known that I would be rather useless when we hit contact with the enemy. My commander looked at me and with a smile said that he was very well aware of that but as he knew every man in the team, he knew what they could do. I was the green one and he needed to first find out what I was capable of. It was a lesson I would never forget. I have also learnt that we should be realistic about what we can and cannot do, what we are capable of and not capable of. It is this “knowing” that prevents us from making unrealistic demands on the men under our command, setting unrealistic expectations or even having unrealistic expectations of our weapons systems. But this knowing goes further. There are many different ways to solve a problem. Sometimes, we are well prepared by our military schools but more than often the theoretical war does not match the real war. Situations and terrain change rapidly and frequently as does the enemy. There is no standard template-plan that we can simply superimpose on any given military problem. We need to think beyond the box but sometimes even our boxes are small and limited. Additionally, we need to know the enemy we are facing, his weapon systems and capabilities, his tactics and techniques – and his weak points. We also need to know how and why he fights. Only then can we devise workable strategies and actions to counter and defeat him. Fortunately, many of the senior officers I meet are keen to get new thoughts and ideas. They want to discuss and dissect previous successful and less successful operations. They pose theoretical scenarios and discuss them. They want to debate the pros and cons of tactics, techniques and procedures. There is a desire to learn and make new “discoveries”. These discoveries of “new methods” breed a deeper understanding and analysis of any given situation. They do not let ego and pride get in their way. Expanding our knowledge of ourselves and our enemy aids in flexibility to situations as well as being able to rapidly adjust to new situations. (This does of course presuppose that those giving the advice know what they are talking about and are doing so with the intent to help. Sadly, I have come across some advice-givers in Africa who very definitely have alternate agendas). Like many of my contemporaries, I have seen senior officers held hostage by their pride. Many insurmountable problems could have been solved, had it not been for misguided pride and poor planning. At times such as those, there is a fine line between pride and stupidity. Whether it is pride or just plain stupidity and arrogance to underestimate the enemy, the terrain, and overestimate our abilities and so forth is in this context irrelevant. The fact is that sometimes we don’t really know ourselves and we end up tripping ourselves – and giving the enemy an advantage he will exploit. An exit strategy can only be effectively implemented if an operation has been successfully executed. • The enemy is forced to negotiate from a point of weakness. The exit strategy is, of course, always part of the overall strategy (or should be) and is indeed, from a military point-of-view, implemented upon the successful conclusion of combat operations. It is therefore usually the final phase of the military strategy. Thereafter follows the continuation of the political strategy aimed at ensuring stable governance, political advancement and so forth. Military operations that are undertaken without an exit strategy are nothing other than poorly planned military operations as all operations have a beginning and an end. Similarly, all combat operations have a beginning and an end, whether it is a patrol, an attack or a retrograde operation. When strategists run out of options and hurriedly discuss force level “draw-downs” and “troop surges” it becomes apparent that the strategy was both incomplete and flawed from the very beginning. Had there been a comprehensive sound strategy to begin with, these types of comments would not have been necessary. The problem is, in my opinion, amplified when it is coupled to an uncoordinated, poorly-planned media strategy. By exclaiming the surges and draw-downs before the successful conclusion of military operations, we add value to and boost the enemy’s propaganda efforts. We both trumpet to the enemy that we planned badly and need more troops or actually tell the enemy that we are unable to sustain our combat operations and therefore need to withdraw. Either way we bolster enemy morale and embolden their commanders who in turn become even more daring in their actions as we have presented them with additional options. This impact on own forces morale needs no explaining, this apart from having fewer troops in theatre to deal with the enemy. Had we initially planned in depth and ensured our strategy was intelligence driven, these actions would simply happen without unnecessary fanfare and in the process, may even catch the enemy off guard. But an additional danger we create for ourselves is alienating those members of the local population who remained neutral and did not actively support the enemy. The local population’s desire to survive, despite all the hardships they may face, will encourage them to, if not actively, then at least covertly, begin to side with and support the enemy. This survivalist approach to supporting the enemy, who thanks to our poor plans, may begin with providing snippets of information and can escalate to assisting in areas such as logistics, communications, early warning and so forth. It can even boost enemy recruitment efforts. This switch of support alters our operational landscape drastically. In short, whether true or not, we actually tell the enemy that he has won the fight. Again, the psychological impact needs no explaining. Bolstered by what he perceives to be our defeat, the enemy will begin to take control of the local population, especially in areas not extensively patrolled, thus adding to the environmental hostility our troops must operate in. On the homefront, these perceptions may initially be well received but at their heart lays a certain amount of expectation that, if not met, creates the belief that a deception has taken place. This can lead to anger and pressure to withdraw our forces, even if it implies a withdrawal without much honour. Conversely, by creating these perceptions, real or imagined, it seems little thought is given to the negative influence this may have on our own operations and how these perceptions may endanger our troops. I believe this is irresponsible and nothing short of madness. Whereas there can be no doubt that Rules of Engagement (RoE) are important in determining how, when, where and against who armed force shall be used, are we not sometimes restricting ourselves with RoE and in the result causing the deaths of our own soldiers? In Operations Related to War (ORW), the RoE are really very straightforward, especially as one of the aims of war is the annihilation of the enemy force. However, care still needs to be exercised in order to prevent civilian casualties or causing unnecessary, excessive damage to private property. But even in well planned and executed ORW, it is not always possible to prevent civilian casualties or minimise damage to property, especially in and around urban environments. It is, however, when we embark on Operations Other than War (OOTW) that these rules can become restrictive and, in many instances, counterproductive. “Don’t shoot until you are shot at” is difficult to accept when you know a sniper is tracking your movements. RoE, and the approach to applying such rules, differ from culture to culture. Furthermore, OOTW are often applicable to hostile environments and an enemy that does not abide by any laws, be they local, regional or international. Whereas it is commonly accepted that excessive force in OOTW will result in alienating the local population and cause resentment which may strengthen the cause of the rebels/terrorists/insurgents, the rules still need to be very carefully crafted. Any commander’s aim is to, apart from achieving mission success, prevent casualties amongst his own forces whilst increasing the casualties amongst the enemy’s forces. But sometimes the RoE appear to disregard this fact in favour of not upsetting the politicians, the enemy or the media. When the RoE are so restrictive that a commander cannot perform his mission effectively, tension will inevitably develop between the political masters and the military commanders. When the restrictive RoE leads to own forces casualties, the tensions are bound to escalate. As all military operations are politically driven, too restrictive rules place the commanders at a disadvantage. When the political masters decide to use military force to achieve their political or diplomatic ambitions or objectives, they ought to consider that the lives that may be lost due to their restrictions could lead to operational disasters and a drop in morale, both on the battlefield and on the home front. But, military incompetence should not be hidden behind or blamed on restrictive RoE. Blunders such as the so-called peacekeeping missions in Africa are commonly blamed on too restrictive RoE. The lack of will, the inability to gather and act on intelligence or develop sound military strategies is usually ignored at best or simply never mentioned. On the other hand, too loose RoE can lead to the indiscriminate use of armed force against whoever passes through the sights. Whereas it may appear that artillery and air strikes on densely populated urban areas may break the morale of the enemy and the civilian population, these actions also violate international law as they are construed as “excessive and indiscriminate force” – which they are. When crafting RoE, we ought to remember that the world has become a tough neighbourhood. If we wish to play in this neighbourhood, we ought to show our toughness – not by allowing our troops to be killed by the enemy but by killing the enemy. We can only do this if we know “who” the enemy is. Knowing “who” the enemy is requires intelligence that is verified. In ORW this is, again, relatively simple as a state of war exists between two nations. We know who we are fighting. In OOTW, a lack of intelligence allows us to either view the “enemy” as the local population or the local population as the “enemy”. This confusing view on the “enemy” results in RoE that restrict offensive action – one of the fundamental principles of land warfare. In turn, this gives the enemy the initiative. The lack of intelligence and the loss of the initiative may result in the rebels/insurgents/terrorists resorting to criminal activities to fund their operations. This can result in extortion, kidnapping for ransom, armed robberies and other financially rewarding crimes. I disagree that today’s wars are either won or lost at the political level. A lack of real progress on the battlefield or in the area of operations, coupled to increased casualty figures, increased defence spending vs lack of results, resentment from the local population, negative media coverage, a decline of morale on the home front and so forth may add to the political pressures to leave a conflict area. But, this is a direct result of the military action. Without intelligence, we cannot craft sensible Rules of Engagement. The lack of sensible RoE gives the enemy an opportunity to exploit the perceived lack of “fighting spirit”. Not understanding the cultural environment we operate in amplifies this problem. Whereas Rules of Engagement are important, they should be based on sound intelligence and an understanding of the operational environment and not sacrifice operational freedom or expose troops to unnecessary danger. Many folks have written asking why I have been so slow in updating the blog. Being unable to update it on a daily basis has been a concern to me but I have been here, there and everywhere which has made it rather difficult to do daily updates. Hopefully, I shall be able to catch up on the blog and several other outstanding issues over the next couple of days. A few weeks ago I was contacted via the blog asking if I would consider attending the St Petersburg International Economic Forum. I was very honoured to be invited as a panellist to the 14th St Petersburg International Economic Forum in Russia. My participation as a panellist was on the session related to “New Models of cooperation for the Military Industry”. Once known as Petrograd and as Leningrad, St Petersburg is a beautiful city and is indeed a massive museum under the Russian sky. As I love history and art, there was no shortage of places to visit and sites to see. The St. Petersburg International Economic Forum is held with the support and participation of the President of the Russian Federation. The aim of the Forum is to gather the world's leading decision makers from government, business and civil society to identify and deliberate the key challenges facing emerging markets and the world and engage communities to find common purpose and frameworks to forge solutions. One thing that has always struck me on this type of travel is the kindness of strangers. 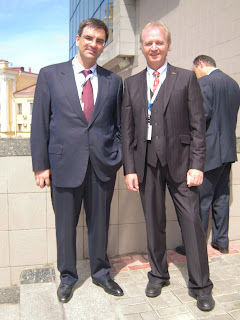 Mr Sergey Nedoroslev, the Chairman of the Board of Kaskol, noting my confusion, stepped in to help me on numerous fronts. I was also privileged to meet some of his friends and associates which included Mr Nikolai Kovarsky, Mr Evgeny Tarlo and the son of Aleksandr Solzhenitsyn. Mr Sergey also made sure that I knew where I had to be at what time. The Forum was officially opened by President Dmitry Medvedev, the President of the Russian Federation on the 18 June and he was joined by French President Nicolas Sarkozy on the 19 June. The panel session on New Models for Cooperation for the Military Industry was very ably moderated by Charles Grant, the Director for the Centre of European Reform. Fellow panellists were Vice Admiral Premvir Das (Indian Navy), Aleksei Alyoshin (First Deputy Director General, Russian Technologies State Corporation), Alexey Isaikin (President, Volga-Dnepr Group), Douglas Harned (Vice Pres, Senior Analyst – Aerospace and Defence, Sanford C Bernstein and Co) and Emeric d’Arcimoles (Senior Exec Vice Pres and Chairman of SAFRAN USA, Inc). Although my small input was focussed on Africa in the main, I thought the comments by my fellow panellists were very interesting and enlightening. However, I still believe that too much emphasis is being placed on technology and terminology changes – and too little on really preparing soldiers for their missions. SO WHO EXACTLY ARE NORTHBRIDGE SERVICES GROUP? Several people have, over the years, alerted me to the fact that a company known as Northbridge Services Group (NSG) are either claiming or posing to be a “reborn” Executive Outcomes. Not only is this a blatant lie, it is a seriously fraudulent manner of trying to attract clients by deception. I am well aware of the fact that NSG enabled enquiries to a website www.executiveoutcomes.com (this was not EO’s true web address) to redirect to their site, trying to give credence to their deception. For the life of me, I fail to understand how a company can act in such a deceptive manner yet expect clients to trust them. "When the classic Executive Outcomes left the civil war in Sierra Leone, they never received payment for $23 million worth of services. In the pursuit of the debt, an English company, Audax Trading, approached the same named company from Michigan in February 2002 about collecting the debt. 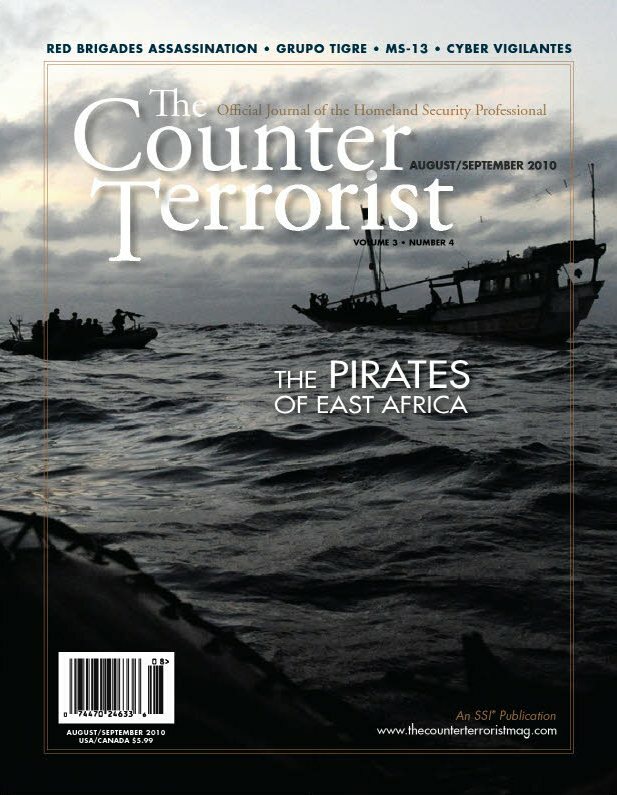 Knowing full well they were not the intended Executive Outcomes, DiPofi and his partner, Eastpointe police officer Christopher Belan, produced fraudulent documents and claims to the government of Sierra Leone via Audax for the $23 million". For his failed efforts to boost the coffers of “Executive Outcomes” and NSG’s, DiPofi pleaded guilty to charges of fraud in 2006. He was sentenced to 40 months in prison at the end of March 2007. Having had a look at NSGs website (http://northbridgeservices.org) I am rather surprised that they can claim to offer “... a highly discrete, totally reliable yet cost effective service...” (I somehow suspect they meant “discreet” as opposed to “discrete”). I am not sure if Northbridge Services Group still exists, but if they do, lies and deceit seem to be part and parcel of their modus operandi – as if the industry doesn’t have enough bulldust artists posing out there. Although Northbridge Services Group was NEVER part of, associated with or linked to Executive Outcomes in any manner or form, this still begs the question: Who exactly are these buffoons? Whereas I do not doubt the numerous qualifications of the NSG president (He has served in numerous leadership and command positions in the light infantry, mechanized infantry, cavalry and tank units. He has commanded six platoons, three companies and two battalions. He has been a tactics instructor and doctrine writer in both the US Army Armor and Engineer schools. He is an Airborne Ranger and is Jungle Expert qualified and has earned the Combat Infantryman's badge), I certainly doubt their integrity. Perhaps their president, Lt Col (R) Robert W. Kovacic can answer this for me as I am quite anxious to know. JUST HOW EFFECTIVE ARE COMMUNICATIONS OPERATIONS? Communications operations are conducted at two distinct yet inter-related levels: The strategic level and the tactical level. At the strategic level, Strategic Communications Operations (SCOs) or STRATCOM, also referred to as Strategic Information Operations, is nothing new in the “war of words” to discredit, demoralise and/or disrupt an opponent and boost the morale of the citizens and own forces. It can even be used to turn a legitimate organisation into an illegitimate organisation. But, the converse is also true: it can turn an illegitimate action into a legitimate action. At this level, these operations entail more than simple rumour-mongering. They are used to give a government or a force an advantage in their fight against a real or perceived enemy. But they ought to include white, grey and black propaganda in such a manner that the receiver (reader, listener or watcher) at a minimum becomes aware of the message and at best, believes it. In South Africa, and indeed in Africa, we witness the use of SCOs or propaganda warfare on a daily basis – as well as its effects. Some of it is actually quite good. Some of it is rather pathetic. But, despite my opinion of it, it still reaches many people out there and ultimately, it is the people who decide on how this will influence their lives – or react to it. The result of all of this is, when comparing the West to the East, is that the US’s AFRICOM is now seen by many in Africa as a wolf in a sheep’s clothing and the Chinese as a sheep in a wolf’s clothing. That in itself shows the effect of these types of operations. It also shows how these types of operations can backfire on the originators. Truth be told, these operations are financially very expensive. As an example, the US military has spent in excess of US$ 1 billion the past three years in Iraq and Afghanistan alone in trying to counter its enemies there. The result of these operations remains debateable. Just as warfare has certain primary and dynamic principles, so too do SCO’s have primary and dynamic principles. To succeed with any SCO, an intimate knowledge of the enemy or target group is required. If this is knowledge is not present, any hoped for success will remain that – hoped for. Knowing the “enemy” – or the target audience – will determine such basics as what language the message needs to be transmitted in. Paid-for news articles, advertisements, billboards, radio and television programmes, and even polls and pressure groups need to promote their messages in a language that everyone (or at least the vast majority) will understand. But, language is not the only criterion that is of great importance: culture, beliefs, level of education and so forth all determine how the message should be packaged in order to achieve maximum success. I am reminded of a foreign company that wrote to me claiming they had a contract to “do Africa” and asked if I could recommend someone who spoke “African”. This is a basic example of how misinformed many are. When these companies get involved in SCOs, the end-result can only be terrifying at best. The second principle of these types of operations is centralised control. Without centralised control, everyone will be developing and preparing their own uncoordinated messages and subsequently, these messages will clash with one another and render the entire operation a waste of time and money. They will also show that they are simply part of a (poorly) planned operation and therefore lose any potential value they may have had. How the information will be packaged is likewise very important. The best message, poorly packaged will be poorly received. Incorrect packaging of the message serves no purpose if it will never reach the intended audience or target, let alone achieve the desired effect. Furthermore, pro-active planning is critical in achieving success. In order to gain the initiative and maintain it, plans need to be formulated well in advance and those plans must be based on intelligence (reality) and not on perceived reality. SCOs can also used to negate High-Value Targets (HVTs) or turn their followers against them. Again, detailed intelligence, coordination of effort, packaging and pro-active planning is critical to success. At the tactical level, these operations used to be known as Communications Operations or COMOPS. At this level, the aim is to meet and discuss issues of mutual importance with the village elders and provide much needed assistance and support to the villagers in the Area of Responsibility. In essence, this is the “hearts-and-minds” war and many a young South African soldier can testify in having partaken in such operations. It is here that, should any semblance of success be wished for, the tribal customs, beliefs and traditions be known, understood and applied by those conducting the COMOPS. It is at this level that vital information and intelligence is gathered and the support of the local population is either won or lost. If the battle is lost at this level, the gunfights that follow will bring about nothing but a hollow victory. Those that plan these operations, especially at the strategic level, have so much technology at hand – mobile phones, blogs, social networks and so forth – that they have no excuse for their poor performance. But looking at what is going on around me, I have to ask if these operations are successful. They present a golden opportunity to the user if correctly planned, packaged and executed but when they are haphazardly implemented, they cause more damage than good. HAS COIN MADE US LOSE FOCUS? Counter Insurgency (COIN) is a topic that is currently the subject of hot debate. Its leap to prominence stems from the hard lessons currently being learnt by the forces engaged in Afghanistan, Iraq, Pakistan, Sudan, Somalia, DRC, Yemen and so forth. Ironically, we seem to be continually thinking up new names, phrases and terms to ascribe to this not-so-new method of doing battle. Although no universally accepted definition of an insurgency exists, it is commonly accepted that it is a movement with a specific political aim. In achieving its aim, the insurgent movement can resort to violence or to non-violence. But ultimately, the movement is dedicated to using either subversion (active or passive) or armed actions to overthrow a constituted government with the aim of replacing it with their own form of government – with the support of the local population. Guerrilla warfare and acts of terror and intimidation are simply two of the methods the insurgents will regularly adopt to achieve their aim. There is however nothing new about an insurgency, apart from the weapons availability and technological ability of some insurgents. From my own limited experience, Angola, Sierra Leone and Indonesia were examples of insurgencies where violent actions were employed by the insurgents to overthrow or pressure those governments. But it appears as though a whole new cult-following has been established when it comes to countering insurgency and no cognisance is given to the lessons that have already been learnt and are clear to see. These lessons very clearly point out that an insurgency can be defeated. Effectively countering the insurgency does not require a dedicated COIN army. It requires a conventionally-trained army doing conventional warfare correctly. This training, with its discipline and fire control, allows for flexible operation plans and an easy adaption to different tactics, techniques and procedures and adds operational flexibility. The army, however, needs core competencies in counterinsurgency (COIN) operations as well as in counter-terror (CT) operations. But it does not need to change its entire posture. • Its ability to gather intelligence. This requires focussed HUMINT operations and not massive technological operations. The HUMINT targets include operational plans of the insurgents, bases and hide-outs, their logistical supply lines, where IEDs/landmines are being manufactured, etc. These critical factors will not be identified using technical means. However, to get to successful HUMINT operations requires sound intelligence strategies and thorough planning. • Its understanding that the spoils of the conflict are the minds of the local population. A lack of cultural respect and tradition, heavy-handed tactics against innocents, collateral damage and so forth will simply increase the flow of recruits to the insurgents. • Its ability to influence the local population by means of operations other than war. An insurgency is however a progression phase of the conflict and is not the main conflict. As such the insurgency lays the groundwork for a future phase of war. 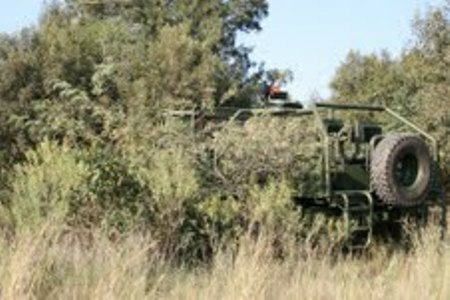 • Mobile warfare aimed primarily at rear areas with the aim of cutting supply lines and capturing arms and ammunition. This is not a phase where AFVs are employed but should rather be viewed as a phase in which the insurgents mount large-scale operations. Vehicles may be used to deliver them to close proximity of their targets. • Conventional warfare – a phase where mass support from the people has been given to the insurgent movement – a phase where numbers and anger will tell . There are many very valuable lessons pertaining to the effective neutralisation of insurgencies. But, one of the most important issues to take note of is that ultimately, the armed forces will find themselves caught in a clash of cultures. Failure to understand, plan and effectively utilise this factor to their advantage will lead to a long, hard war-of-attrition – and allow the insurgents to realise their strategy. Perhaps it is time we revisited the lessons we have already learnt and somehow forgotten about. As I am about to go away for a couple of days, I shall unfortunately not be able to respond to any new comments posted on the blog. However, I shall not be gone for too long and all things being equal, I shall be back on or about 16/17 January. Please do not stop visiting and/or commenting...I shall respond to every comment upon my return. Normally, I tend to ignore imposters as I have personally met several people over the years impersonating me or claiming to have started Executive Outcomes or even to have commanded it, managed it or planned its actions. However, I was recently alerted to my apparent Facebook page. The person impersonating me on Facebook is using both my name and the company logo of Executive Outcomes. I have tried to contact Facebook to report this issue of “identity theft” but have not been successful. Additionally, many people who visit this blog have written and asked me why I don’t respond to them on Facebook. The answer is quite simply: I have never had a Facebook profile. To those of you who have tried to contact me on Facebook, I am sorry that someone has been using my name and EO’s logo to bait you. This lurker and identity thief must have a very devious and nefarious reason for doing this. But, given my inability to have Facebook take action against this waster, I have decided to do so myself and expose this dishrag as both a fraud and an imposter. Added to that is his apparent attempt to use the name of a once-great company to either gather intelligence or generate business for himself. One can sink no lower than that, especially as I doubt if he would have had the moral fibre to have been part of EO. Due to my own self-imposed blog policy (to refuse the use of foul language), I am forced to only tell this fraud to stop using my name and the logo and name of Executive Outcomes and to get a life. Despite the controversy over the term, the phrase “narco-terrorism” is increasingly used to refer to known (and unknown) terrorist organisations that use the illicit drug trade to fund their operations, entice followers and buy expertise, weapons and explosives. What initially started off as attacks against counter-narcotics agencies in South America – and particularly in Peru – has become a methodology used by illegal drug traders and traffickers to build up forces and attempt to influence the policies of governments and societies by means of violence, intimidation and terrorism. Whereas the destruction of their crops is a good start, it cannot - and should not - end there. There are many other targets that can be attacked over a wide front to destroy this enemy and no stone should be left unturned in eradicating this scourge. Indeed, those who prefer this path should be attacked with aggression and cunning and given no moment of respite. Yet the West seems to be afraid of infringing on the human rights of the drug traffickers, syndicates and cartels despite its calls for these activities to be stopped. Ironically, when drug traffickers/mules are sentenced to death in the East, European governments protest loudly and call for clemency, claiming the convicted suffer from some incurable mental disease. However, this “mental disease” seems to surface only once the perpetrators are caught. Will we witness a similar pattern when these governments are dealing with narco-terrorists? Do these traffickers and dealers have any mercy on those they have dragged into the murky world of drug addiction? When their ill-gotten gains are used to purchase weapons, explosives and know-how, do they for a moment stop to consider being merciful towards those they are about to kill? I doubt it. That most basic law of economics – the law of supply and demand – needs to be readdressed, reanalysed and the situation re-appreciated. Part of this problem is that the purity, along with the demand, of many of these illegal substances has risen while the prices have dropped. This has widened the market and increased sales. This in turn empowers the criminal syndicates and cartels, damages the legitimate economy, creates additional strain on law enforcement agencies and adds to a climate that breeds terrorism. According to Interpol, the illicit drug trade is a major source in funding terrorism. Apparently it is a US$ 400 billion business annually, taking about 8 percent of the world’s trade – and growing. This implies that the organisations running this global empire have sufficient funds to source and buy whatever they need to expand their empire. Stopping them will require more than simple crop-burning. Narco-terrorism needs to be attacked over a wide front, utilising overt, clandestine and covert methods – with no regard to the human rights of these criminals. Failure to do so will simply increase the revenue stream to the terrorists. Additionally, the underlying issues of addiction and prevention should be addressed in order to reduce the market size and demand. Taking the fight to the narco-terror networks should be Priority #1. This requires an intensified effort to infiltrate/penetrate the cartels and syndicates, direct hard action against the villas, haciendas and other hideouts and laboratories, intercept mail and telephone calls to identify and target accomplices, freeze bank accounts (these funds can be used against them), show no mercy when applying the law against them, sanction governments that provide succour to the narco-terrorists, disrupt them in their own areas, identify and attack High Value Targets and so forth. The financial gains the narco-traders and narco-terrorists make from their crimes stem from the host of buyers, sellers, traders and traffickers. This grouping should be likewise targeted without mercy. Prison sentences in cushy jails should not even be a consideration. Instead, they should receive hard labour sentences where they are given no respite. Let them build roads with picks and shovels – even in areas where no roads are needed. The west coast of Africa is increasingly becoming a hub for the illegal drugs trade and trafficking from especially South America. What was once known as the Gold Coast is rapidly becoming known the Coke Coast. If no action is taken, this volatile area may soon become a focal point from which not only increased drug trafficking is launched into Europe, but very possibly narco-terrorism. But, the longer this serious issue is ignored, the more time the narco-terrorists are given to entrench themselves and their followers, build their networks and wreak havoc. But this volatile area in Africa is also starting to produce its own drugs – the implications can be imagined. 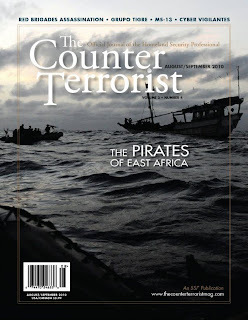 Likewise, East Africa is also becoming a hub for narco-terrorism. Despite the noises made about narco-terrorism, it is unlikely that much real effort will go into stopping this very lucrative and dangerous criminal endeavour. Where efforts are made, they fall far short of denting the narco networks. Throwing money at a problem will not make it go away. Only a decent aggressive strategy will do that.